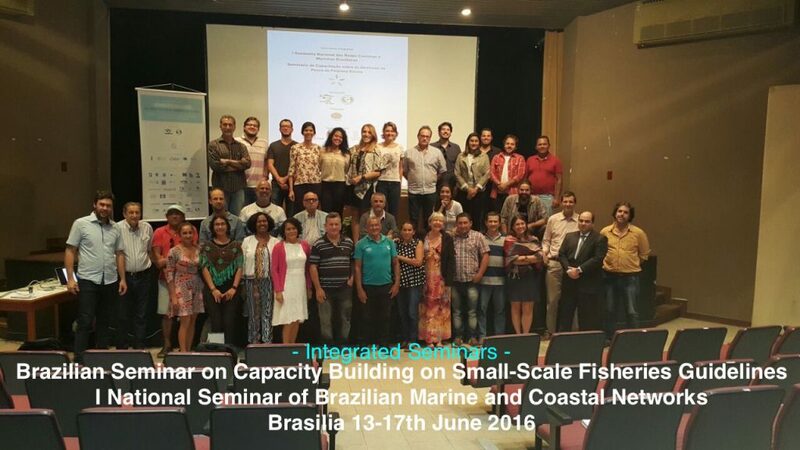 From June 13 to 17, 2016, approximately 40 fishers, leaders, civil society organizations’ representative, and researchers met in Brasília, Brazil, to engage with capacity-building and advocacy demands of fishers’ organizations. The aim was to discuss the implementation of the Voluntary Guidelines for Securing Sustainable Small-scale Fisheries in the Context of Food Security and Poverty Eradication – SSF Guidelines. The workshop is part of the International Fund for Agricultural Development (IFAD), a specialized agency of the United Nations, focused on implementing a project granted by a group comprised of the World Forum of Fisher Peoples (WFFP), the World Forum of Fish Harvesters & Fish Workers (WFF), the International Collective in Support of Fishworkers (ICSF) and Centro Internazionale Crocevia (CIC). The workshop was co-financed by Ombudsperson of the Sea and Too Big to Ignore (TBTI) Project. The aim of the workshop was to promote awareness about the SSF Guidelines and to mobilize support for their implementation across several countries of the Global South through a methodological, analytical and descriptive approach. An additional objective was to build capacity, in particular, among fishers’ organizations to position them as the key actors in the implementation process. The workshop was also an opportunity to document existing governance practices of tenure and resource management to enhance SSF rights on resources and territories, and guarantee respect of human rights. Values, norms and principles embedded in the governance and resource management practice, which are essential for facilitating the implementation of the SSF Guidelines in Brazil, were adopted from the perspective of autonomy. This, in turn, stimulated the discussion on suitable training and experience exchanges to disseminate local knowledge, using a broad participatory and communication process. A broad range of participants, including national and international small-scale fisheries organizations, researchers and governmental representatives, who were engaged in the process of developing the SSF Guidelines, attended the workshop. The United Nations Food and Agriculture Organization (FAO) facilitated the SSF Guidelines participatory consultation process and the FAO Committee on Fisheries (COFI) adopted the SSF Guidelines in 2014. The adoption of the SSF Guidelines followed nine years of intense debate led by fishers from around the world, who were seeking gender equality, geographical representation (e.g. inland, marine and coastal fishers), as well as the representation of fishworkers, fishing communities, traditional and indigenous fishing communities. During the consultation process, the participation of observers from ICSF Latin American Associates, WFFP, WFF, FAO, IFAD, TBTI, and International Planning Committee for Food Sovereignty – IPC was also encouraged. When a draft of results and deliverables were provided, the Brazilian Government was invited to participate to ensure the involvement of the relevant Ministries and Government Agencies from the beginning of the implementation process. The Brazilian stakeholders involved in the participatory consultation process recognized the SSF Guidelines adoption as a milestone achievement. However, the challenges, commitments and capacities to implement the SSF Guidelines can vary within regions and fishing communities as well as the national policies and strategies for fisheries management. We should not assume that the implementation process will be simple, or that the SSF Guidelines will lead to immediate responses, or that results will happen in the short term. As such, it is essential to collect, document and analyze the implementation processes. Five working groups were established, each responsible for reviewing decisions and outcomes from the past activities in Brazil, that are related to the SSF Guidelines principles, issues and approaches. These recommendations were combined in order to allow a better understanding in the context of the current regulatory framework and existing public policies within the thematic groups set out in the SSF Guidelines. Although a comprehensive survey was not conducted, efforts were made to specify the most relevant legal instruments and policies that can, in principle, foster the implementation of the SSF Guidelines, as well as those, which could hinder the implementation. Based of the synthesized recommendations and the input of the civil society, a summary outlining challenges and concerns was drafted. The purpose is to create a compilation of legislation and policies, in light of new challenges, in particular how the SSF Guidelines can reach all fishing communities, the appropriation process, and what internal strategies are needed. Workshop participants outlined a strategy to involve Brazilian society, artisanal fishers and to remind public officials of their moral responsibility to implement the SSF Guidelines. This new approach demonstrates the great importance of SSF for the country's human rights, as well as its social and economic development. However, one of the main findings of the workshop is that there is a serious gap resulting from the fact that Brazil has not yet internalized the SSF Guidelines. The discussed strategy will be presented to the Brazilian Government and forwarded to the United Nations during the COFI meeting, which is taking place in Rome in July 2016. The latter will advance the development of a Global Assistance Program for the implementation of the SSF Guidelines in different countries. The implementation should consider the interests of Brazilian fishermen and fisherwomen, scientists and workers who are supporting the sector. More than 15 organizations related to SSF laid out basic principles in a report, which will surely become a milestone ensuring the rights of fisherfolk in Brazil. The SSF Guidelines must be seen as a guide to develop policy coherence on the national scene in Brazil. The SSF Guidelines should become an instrument for achieving reform of the current complex legal and institutional frameworks to suit international agreements signed by Brazil, enabling its ratification and full implementation. The full implementation of the SSF Guidelines in Brazil is imperative, in particular, given the current political context that closed down the Ministry of Fisheries and Aquaculture, concerns on human rights losses, and attacks on the field of environmental protection, which threatens the natural ecosystems and the preservation of main fish stock population levels that can support a dynamic and sustainable fishery. To view a short video from the workshop with the interviews of the workshop participants, click here. If you are interested in finding more about the next steps in the implementation of the SSF Guidelines in Brazil, please contact teiapesca@gmail.com. Written by Sergio Mattos (cluster coordinator of the TBTI 'Global Synthesis' research cluster).